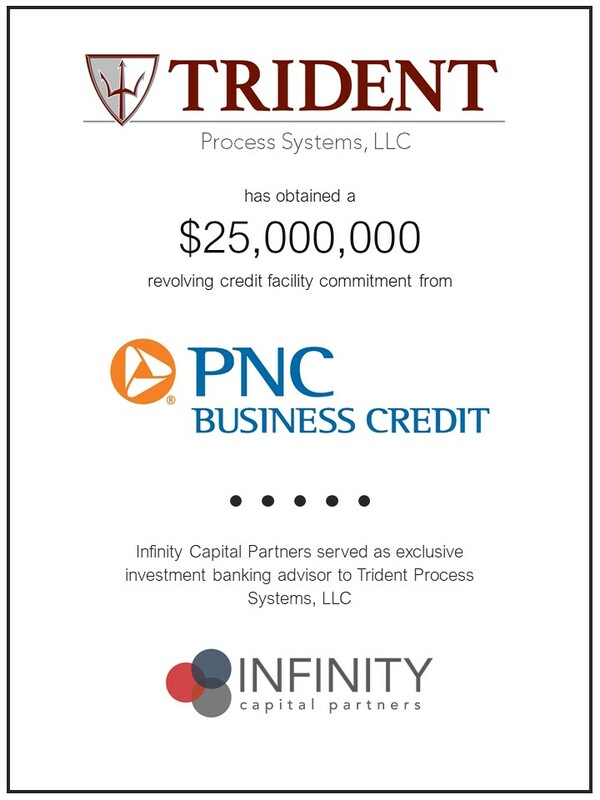 OKLAHOMA CITY, OK (January 7, 2019) Gainesville-based Trident Process Systems, LLC (Trident) announces it has refinanced its $9,000,000 senior credit facility and replaced it with a $25,000,000 revolving asset-based facility with PNC Business Credit (PNC). Infinity Capital Partners served as exclusive investment banking advisor to Trident. Trident Process Systems provides single-source engineering, design, and fabrication of ASME Code process equipment for oil and gas applications. Since its inception in 2014, Trident has quickly emerged as one of the pre-eminent providers of oil and gas processing equipment to producers in the Permian basin. Trident primarily serves large scale producers in the Permian basin, but with the recent expansion of its 120,000 square foot manufacturing facility, the company will seek to expand its footprint into prolific neighboring basins. Founded in 2014 in Gainesville, TX, TPS provides a single source engineering, design, and fabrication of ASME Code process equipment, B31.3 piping skids, and environmental solutions for energy industry customers. TPS fabricates engineered skidded packages, vessels, piping, and structural skids to the production and midstream sectors. For more information, visit www.tridentprosystems.com. PNC Business Credit is a leading provider of senior secured financing for mid-sized companies and private equity firms throughout the US, Canada, and the UK. Across a wide variety of industries, PNC provides loans from $10MM to $1B that maximize access to capital for acquisitions, recapitalizations, turnarounds, expansions and more. For more information, visit www.pnc.com. Infinity Capital Partners is an Oklahoma City-based middle-market investment bank offering a broad range of advisory services to private companies and financial sponsors across a variety of industries. Infinity works closely with owner-operators, shareholders, founders, and management teams of private companies to provide tailored services that include M&A advisory, debt and equity solutions, recapitalizations, and strategic advisory. For more information about Infinity Capital Partners, including a list of current projects, please visit our website at www.infinitycapitalpartners.com. Securities placed through Infinity Capital Securities, LLC. Member FINRA.